With the second annual Blaze 'N' Glory Festival less than a month away, the event has announced the addition of the "SRH 25 Year Anniversary Party" stage, which will feature performances by Long Beach Dub All-Stars, Dilated Peoples, Common Kings, Tomorrows Bad Seeds, Madchild, Big B, and Johnny Richter. SRH has long put on their own music festival dubbed SRH Fest, which brings fans from southern California together to celebrate the best in live music and action sports for one unforgettable, epic gathering. Bands that have appeared on previous SRH shows include NOFX, Pennywise, Offspring, Sublime, Slightly Stoopid, Unwritten Law, Strung Out, Dilated Peoples, and (Hed)p.e. Established in 1991, SRH and its oval spade icon have been blazing a path in Supporting Radical Habits. SRH Clothing has become a major influence and supporter of music that inspires the action sports lifestyle, and has set out to change the face of music, surf, skate, and the motorcycle industries. SRH founder Kevin Zinger commented on the pairing, "We are extremely excited to be doing this year's SRH fest at Blaze 'N' Glory. This is our 25th anniversary, so when the idea of combining forces came up, it made complete sense. We wanted to put together a lineup that represents our flavor of music and lifestyle and Blaze 'N' Glory is the perfect event. It's an honor to have so many amazing artists get involved to perform and support. We have some special guests that will also be joining us, and this show will go down in the SRH history books for sure." 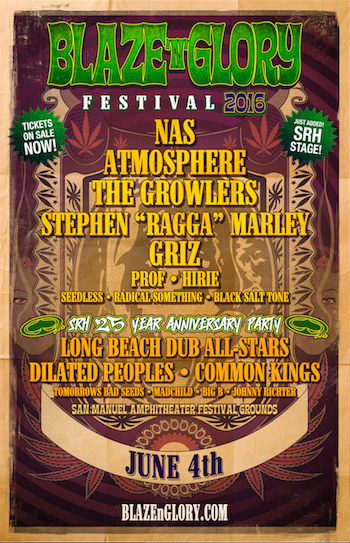 Taking place Saturday, June 4, 2016 at the San Manuel Amphitheater Festival Grounds in San Bernardino, CA, Blaze 'N' Glory Festival will feature hip hop legend Nas, alongside an eclectic mix of performers including Atmosphere, The Growlers, Griz, Stephen "Ragga" Marley, Prof, Hirie, Seedless, Radical Something, and Black Salt Tone on the main stage. Festival attendees will also experience over 100 lifestyle vendors, as well as a midway and carnival rides, craft beer, food trucks and more. The celebrate the SRH 25th anniversary, the Blaze 'N' Glory Festival is offering a special 4-pack ticketing deal running from 10:00 am PT on Friday, May 13th to 11:00 am PT on Saturday, May 14th, where fans can purchase 4 tickets for only $25 each ($100 total), plus fees. Starting today, camping reservations can be made by calling San Bernardino County Regional Parks Department at (909) 387-2583. A very limited number of RV and tent camping sites adjacent to the venue are available. Campgrounds will be open from Friday, June 3 at 3:00 PM through Sunday, June 5 at 12:00 PM. For full details on the Blaze 'N' Glory lineup, tickets, and VIP Packages, visit www.BlazeNGlory.com. Blaze 'N' Glory is a short drive from Los Angeles County, Orange County, San Francisco, Las Vegas, Phoenix, Tucson, San Diego, the San Joaquin Valley, and many more cities in the Southwestern U.S. The one-day music and lifestyle festival—produced by Synergy Global Entertainment (SGE) and Live Nation—will feature music performances in the open area General Admission festival grounds adjacent to the amphitheater.